picture - can you see it? 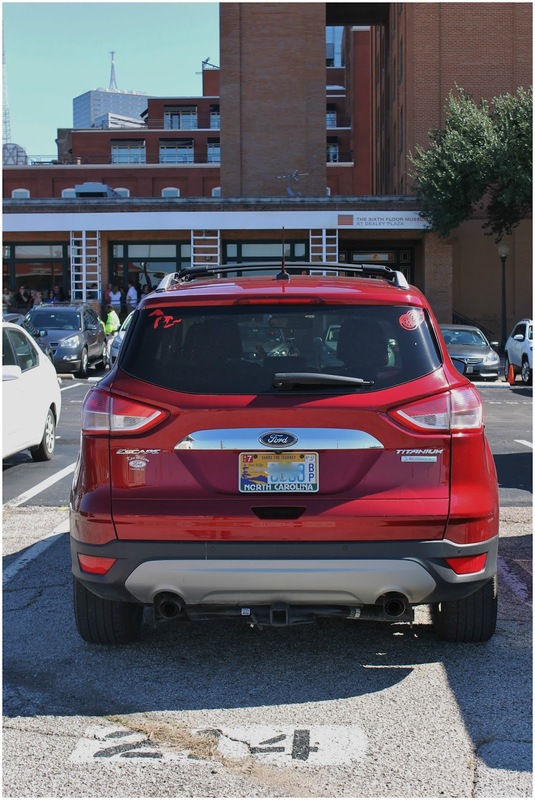 We made a detour off of Route 66 on October 6, 2016 and headed to Frisco, TX just north of Dallas. It was a long drive and a hot one. We once again took back roads and we crossed the state line at the Red River. We settled into our site at the Hidden Cove RV Park and Marina. It is a beautiful oasis at the end of a huge subdivision area, we were getting a little worried as we drove, wondering what we had gotten ourselves into this time. All the sites are back-in but with full hook ups and very wide. If they had wanted, they could have put another site in between each one, like many other campgrounds have done. So glad they didn't. The grounds are well maintained. A few down sides are you have to pay the park entry fee on top of the site fee, there is no WiFi and no laundry room on site. The campground is on Lewisville Lake, a large sports lake, and morning walks with the dog were quite peaceful. We didn't get as much sight seeing done as planned as Nancy had a bout of vertigo the first day in town. Makes it hard to drive around and visit places when the world is spinning so fast. We were only about 30 miles north of Dallas but it took us an hour to get there. The roads here are all under construction, and the area we are in is being built up rapidly so they are widening all the roads. All of the expressways are tollways so we avoided them. 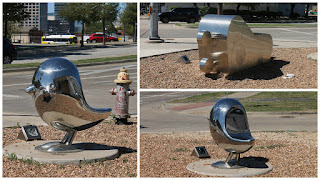 We were impressed with Dallas, while it is a busy and thriving downtown they have a number of parks throughout the city, with fountains and walkways through them. The surrounding suburbs also have great park systems, lots of green space and walking and biking paths. The George W. Bush Museum and Library are on the campus of the Southern Methodist University. The grounds surrounding the building have been left to go wild, which is nice, but made it seem like the building wasn't in operation. They could use a few more directional signs, it was a little confusing to figure out where to park, and then we had to pay for parking. The first time we have experienced that. This is on top of the cost to get in. 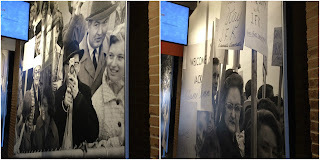 You enter into a large lobby area with glass displays of gifts from other nations and a section that has an ever changing video that runs along the top of the wall. It changes with various pictures of the country, it was pretty cool to watch. This is a shot from one corner. 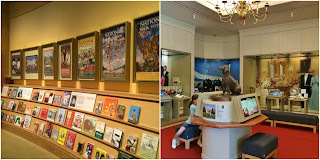 The display area is smaller than most of the others we have been to, but it is laid out well. There wasn't much about his life prior to the Presidency and we like to be able to see that information as it helps to understand the person better. 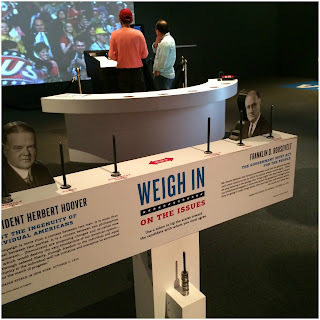 Each museum we have been to has had a replica of the oval office, with all the personal items of that president. This is the only one that has a full scale replica. 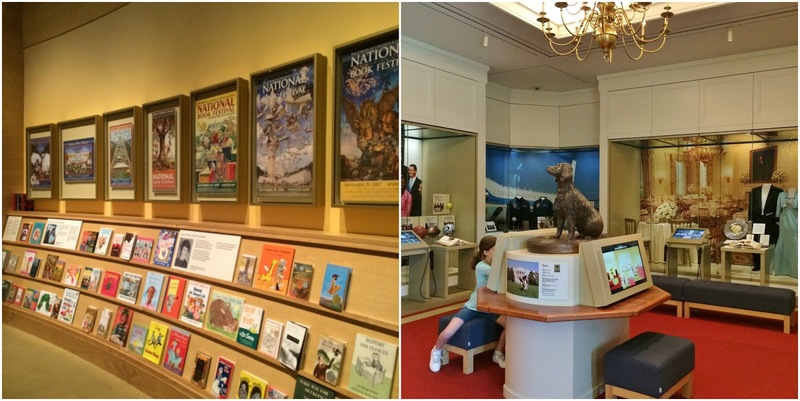 There was a room dedicated to his daughters and a video about life in the White House from their perspective. It can not be easy growing up there. There were a number of interactive displays which is nice and many directed to children which is great. They had computer games for kids to play, where they could find things in the White House. There was also a section about the "No Child Left Behind" program that had a wall full of books. Our thought was we would have never been able to get our daughter to leave that spot, she would have wanted to read all of those books. 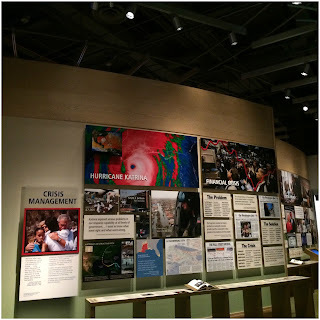 Speaking of our daughter, there was a small display about Hurricane Katrina, (our daughters name). Right next to that was a small display about the financial crises. 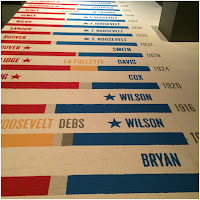 They had a temporary display that walks you through the steps of campaigning to becoming President. It took you through the process today and also looked back on previous elections. It was interesting to see the journey step by step. 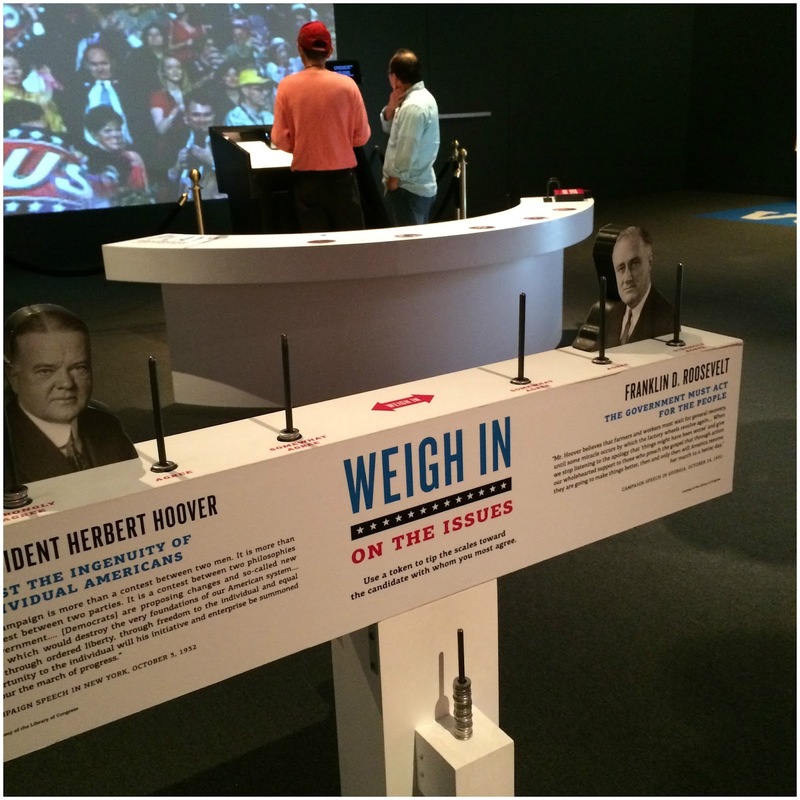 There were displays that you could "weigh in" on topics from previous elections by using washers to add weight to your opinion side. 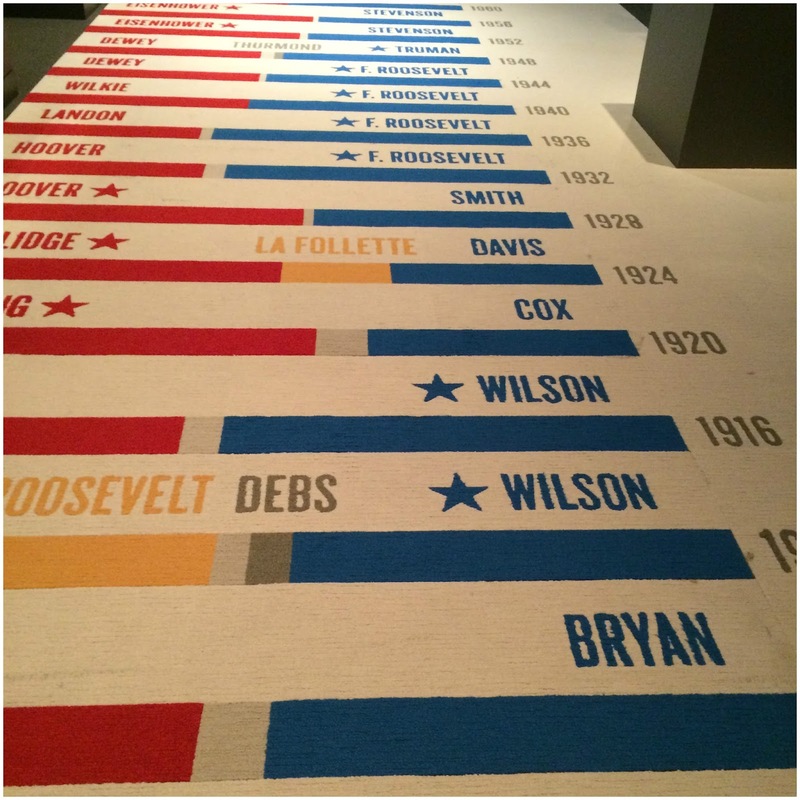 The carpet listed all of the candidates over the years. This is how Nancy's family ended up with their last name. Wilson was president when her Grandfather arrived here from Finland so he changed it from Sjöblom to Wilson. Roughly pronounced seabloom. 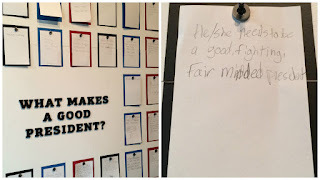 They had a board with the question "What makes a good President?". 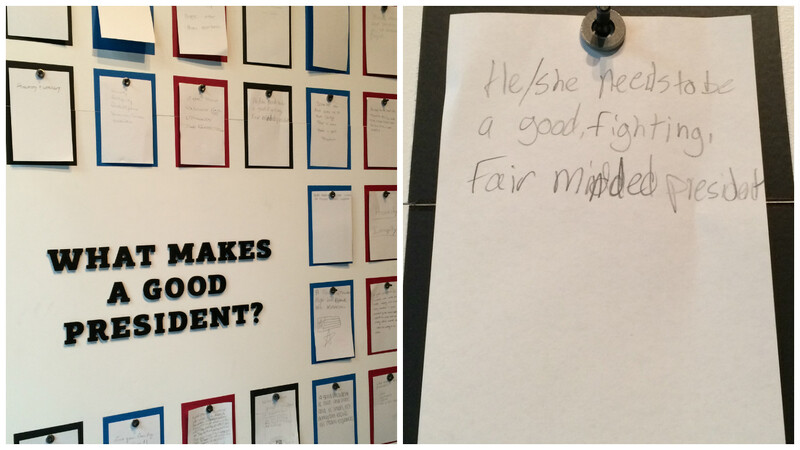 There were peoples answers posted, most were from children. We loved the one about knowing math equations. 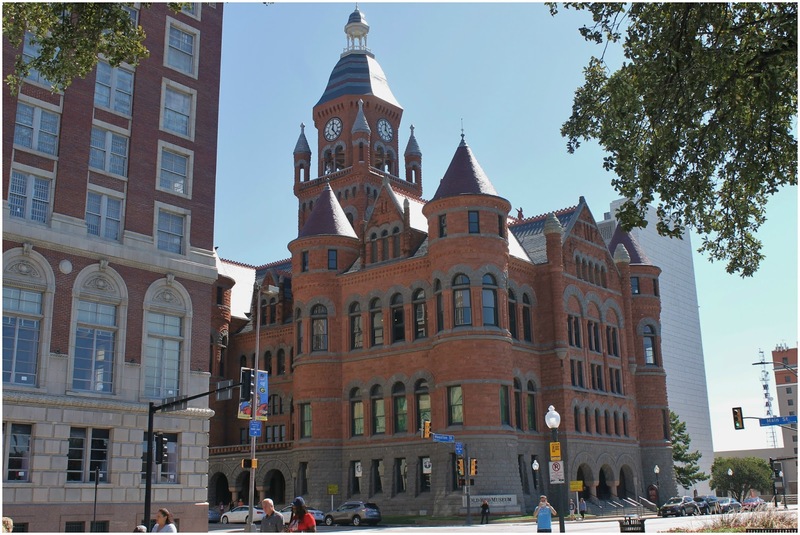 Dealey Plaza was the next stop, another sad day in our history. A day that most people can remember exactly what they were doing when they heard the news. Nancy was only six and can vividly remember coming home from school and her mom was watching TV and couldn't stop crying. Les was 14 and sitting in class, the school board president came to the window and called the teacher over and announced that the President had been shot. 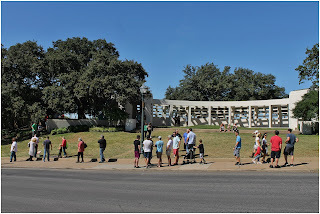 The 6th Floor Museum is in the Book Depository Building, which we had planned to tour, but the wait was almost an hour so we explored outside and wandered the "grassy knoll". The hallway of the ticket area is lined with photos from that day. The look of excitement on the faces of the people in the crowds really stuck us. How life changes so quickly in just an instant. There is a covered walkway on the knoll with a quote from JKF, part of the speech he was going to deliver the next day. 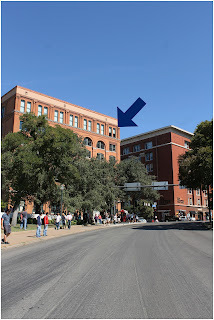 Informational signs point out strategic spots, where Abraham Zapruder was standing while filming, and where the shots hit. 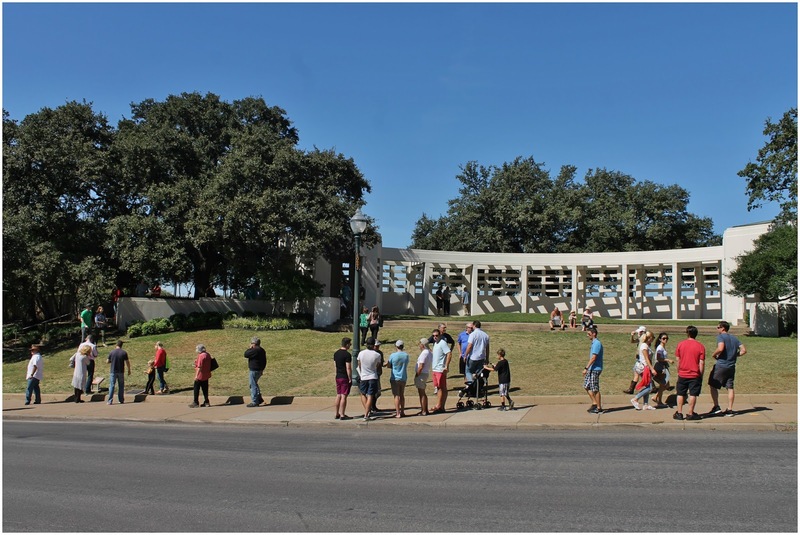 Abraham was standing on the pedestal in the left picture, the white X on the pavement is where the second shot hit President Kennedy. He turned over a copy of his film to the police. There has always been a part of us that doesn't believe the reports that have come out regarding the shooting, and after being here we still believe that there is something not quite right about it. A side note - when we got out of our car after parking, we realized we were in spot 214. Les's Teamster Local. This happens to us a lot. 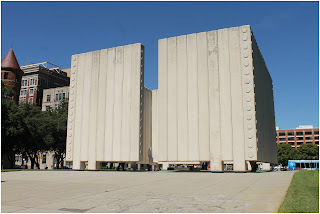 Down the street from the plaza is another memorial to JFK. 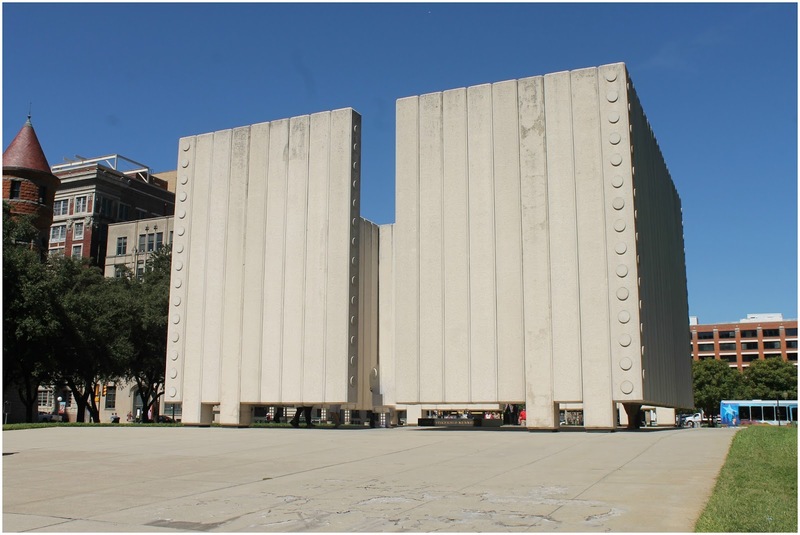 It is a large cement structure that you can walk through. The designer Phillip Johnson calls it an "open tomb" and thought the design would provide visitors with a spot of quiet privacy. It has never been a very popular piece. The Old Red Museum is such a beautiful building. It always makes us happy to see such a gem being kept up. We found a few roadside oddities. 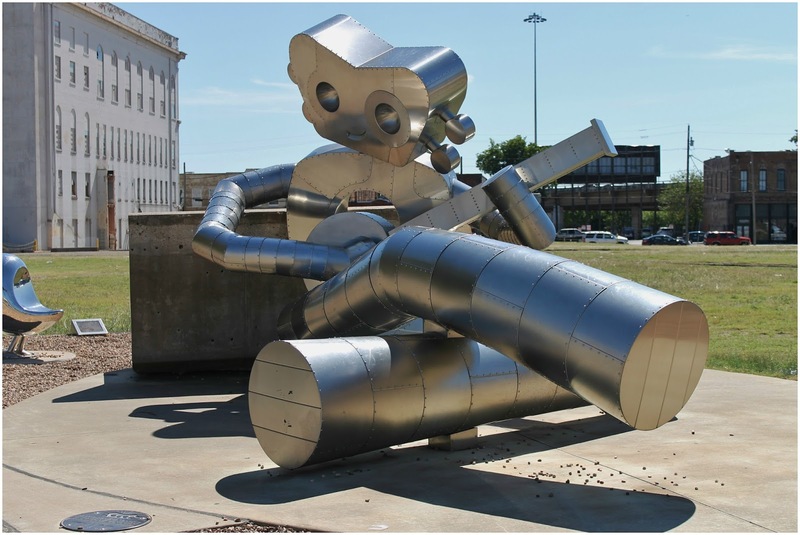 The traveling man is located in three spots and in three different forms. 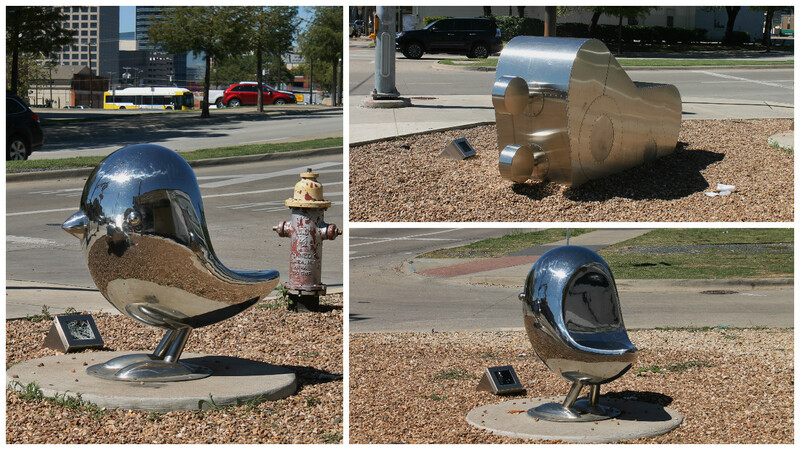 They are the creations of artists Brad Oldham and Brandon Oldenburg. The first is Traveling Man Awakening. 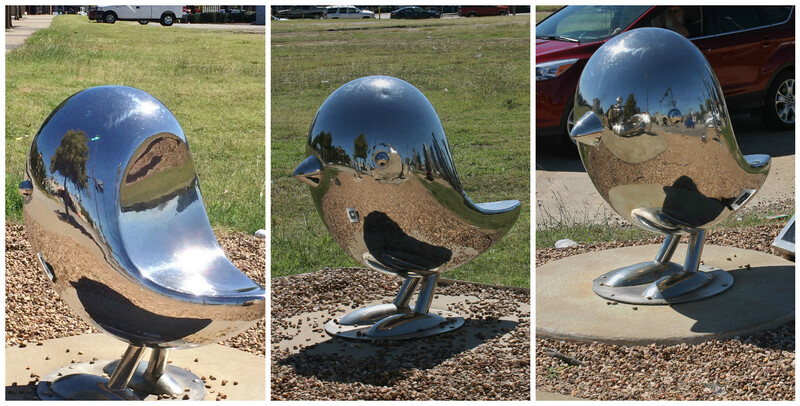 All three sites have the little dollop birds which offer great reflection pictures. The second one is Traveling Man Waiting on a Train. It is across the street from the railcar station. The third is Traveling Man Gumby. 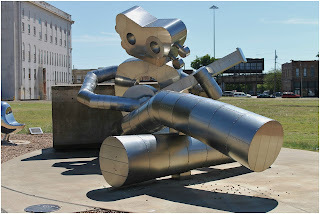 In contrast to the shinny metal sculptures we found the Happy Half-wit Muffler Man. 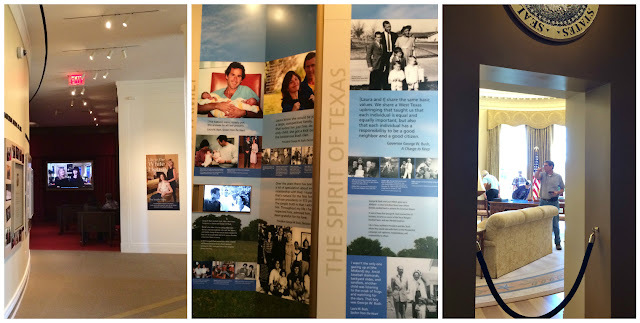 Sunday, we drove to Grand Prairie, another drive that took way longer than it should for the distance we went. Les's cousin Dale and his wife Marianne live here. We haven't seen Dale in 30 years, so it was very nice catching up with him and meeting his wife over a two hour lunch. We were so busy yakking right up till we got into our cars that we forgot to get a picture. We are heading back to Oklahoma and Route 66 next. ~ Dog grooming can be expensive. Mielikki requires a haircut about every 6 weeks. When we started out we were taking her to a groomer where ever we could find one. We discovered it is hard to find someone who knows how to cut an Airedale correctly. Each haircut would cost us between $60 and $80 and she never looked good when it was done. So we took matters into our own hands and bought clippers and cut her ourselves now. We don't always do the best job either, although Les is getting better each time, at least we are not handing over $60 or more for her to look bad!